Russia is injecting outer space into the 2014 Olympics — both literally and figuratively. The host nation for the next Winter Games will launch an Olympic torch on a spacewalk and embed meteorite fragments into a special set of gold medals. Scheduled for Feb. 7 through 23, 2014, in Sochi, Russia, the 22nd Winter Olympics will be preceded by a traditional torch relay to begin on Oct. 7. A total of 14,000 people will carry the torch from Moscow to Sochi, including Valentina Tereshkova, who 50 years ago became the first woman in space. On Nov. 7, a month into the torch relay with the flame still being run across Russia, an unlit Olympic torch will lift off with three new crew members for the International Space Station. "The story of the Olympic torch is part of our mission," Kotov told reporters during a press briefing held earlier this month. "We are going to take... the Olympic torch out with us on our first EVA [extravehicular activity] and we'll take a few pictures and video and downlink them to the ground. And maybe we will have some activity [inside] the station with the Olympic torch." Olympic torches previously flew twice on board the space shuttle, even entering the International Space Station, but have never ventured outside until now. 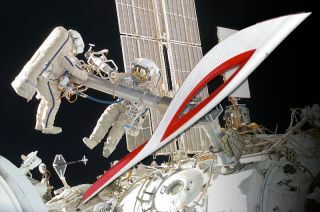 "Conducting a spacewalk with the torch is unprecedented in the history of the Olympic movement and the world of astronautics," added Roscosmos chief Vladimir Popovkin. "Its in-orbit delivery and the spacewalk by cosmonauts will be a bright new page in space history." An example of the gold medal that will be awarded to athletes at the 2014 Sochi Olympic Winter Games in Russia. The aluminum and red colored torch — red being the color of Russian sports — will return to Earth two days later on Nov. 11, landing aboard the Soyuz TMA-09M capsule with cosmonaut Fyodor Yurchikhin, NASA's Karen Nyberg and Luca Parmitano with the European Space Agency (ESA). Three months (and four days) later, on the ninth day of the Olympics, it will be something that fell from space, rather than landed, that will take the Winter Games' center stage. The athletes who earn gold on Feb. 15, 2014 will receive a special medal featuring a chip of the meteor that exploded over Russia a year earlier. The meteor strike, the largest recorded fall in more than a century, resulted in buildings being damaged and more than 1,000 people being injured. "We will hand out our medals to all the athletes who will win gold on that day, because both the meteorite strike and the Olympic Games are global events," said Alexei Betekhtin, culture minister for the Chelyabinsk region, in a statement. Pieces of the recovered space rocks will be inserted into the medals for presentation. Seven of the meteorite-embedded awards will be given to the gold medal athletes competing in speedskating (men's 1,500 meter), short-track speedskating (women's 1,000 m and men's 1,500), cross-country skiing (women's relay), ski jumping (men's K-125), Alpine skiing (women's super giant slalom) and skeleton (men's). Click through to collectSPACE.com to see Russia’s Soyuz TMA-11M mission patch that pays tribute to the 2014 Sochi Olympic Winter Games and the Olympic torch flying aboard the mission to the International Space Station.